Both the particular clips come from films shot shortly before major stock market crashes. 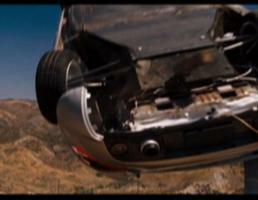 Additionally in each film the crash shown is not a special effect in the sense that the items are not models, facsimiles, computer generated etc. In Buster Keaton’s The General (1926) a real wood burning steam locomotive and in Redline (2007) a real Porsche Carerra GT owned by producer Daniel Sadek the founder of Quick Loans Funding a now defunct subprime mortgage company based out of Irvine, CA. The two clips have had their speed altered according to data from the stock market during the respective crashes (1929 and 2008). The two clips are then edited together by rapidly flashing between the two films. Because of their differing speeds different combinations are seen throughout the video.